Floating photovoltaic (FPV) systems, also called floatovoltaics, are a rapidly growing emerging technology application in which solar photovoltaic (PV) systems are sited directly on water. The water-based configuration of FPV systems can be mutually beneficial: Along with providing such benefits as reduced evaporation and algae growth, it can lower PV operating temperatures and potentially reduce the costs of solar energy generation. Although there is growing interest in FPV, to date there has been no systematic assessment of technical potential in the continental United States. We provide the first national-level estimate of FPV technical potential using a combination of filtered, large-scale datasets, site-specific PV generation models, and geospatial analytical tools. We quantify FPV co-benefits and siting considerations, such as land conservation, coincidence with high electricity prices, and evaporation rates. Our results demonstrate the potential of FPV to contribute significantly to the U.S. electric sector, even using conservative assumptions. A total of 24 419 man-made water bodies, representing 27% of the number and 12% of the area of man-made water bodies in the contiguous United States, were identified as being suitable for FPV generation. 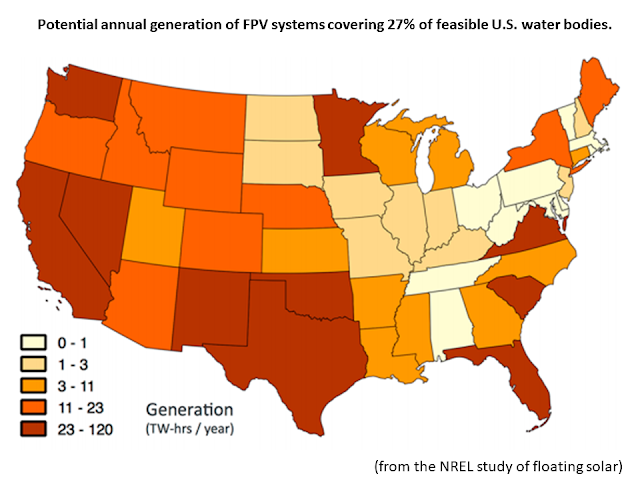 FPV systems covering just 27% of the identified suitable water bodies could produce almost 10% of current national generation. Many of these eligible bodies of water are in water-stressed areas with high land acquisition costs and high electricity prices, suggesting multiple benefits of FPV technologies. To date, FPV has been installed predominantly on manmade bodies of water, such as wastewater storage ponds, reservoirs, remediation and tailing ponds, and agricultural irrigation or retention ponds.1,7 The first FPV installation came online in 2007 at the Far Niente Winery in California, yet the vast majority of existing systems (98%) became operational between 2014 and 2016.1,8 As of 2017, global installed capacity was approximately 198 MW, with additional projects, including what will be the world’s largest FPV system at 70 MW, expected to come online in 2018.9 System sizes vary dramatically across the world, ranging from 4 kW to 40 MW.1,7,9,10 FPV systems have also been installed in more than a dozen countries throughout Southeast Asia, Europe, North America, and the Middle East, but Japan has the majority1 (80%) of FPV installed capacity, including 70 of the largest FPV systems in the world.8,9,11 The United States has seen limited adoption of FPV to date, but institutions such as reservoir operations, water treatment facilities, and residential communities are increasingly exploring its applications. Current FPV Projects and Generation Potential. Potential Co-benefits and Siting Considerations of FPV. The field of implementing PV systems over water is a nascent field, with just over 100 projects internationally and seven projects in the United States as of the end of 2017. Most of what we know about FPV is derived from this limited number of projects and has formed the assumptions on which this assessment of its technical potential in the contiguous United States is based. With this limited number of projects (the majority of which are less than 2 years old), there is a lack of empirical data documenting long-term system performance, financial burdens, operations and maintenance, material science, environmental impacts, and other key factors. With the rapid expansion of projects coming online both domestically and internationally and the growing interests in FPV research, we can expect an equally rapid increase in case studies and publicly available data to follow. This burgeoning attention will open the doors to answering questions about realistic expectations for a FPV system. To address these long-term knowledge gaps, research needs to be conducted on the material durability of FPV, such as how these systems may endure in various climates and conditions. Although this paper calculates the technical potential for FPV systems using geospatial tools, there are other site-specific limitations that may affect the feasibility of a certain location. The high-level data used and analyzed lacks the resolution for case-by-case feasibility, and the results should only be considered as a starting point for national and regional examinations. This analysis is an approximation and can only be as good as the dataset on which it is based. Further analyses should be conducted to look at the technical potential at the state level with higher fidelity datasets and perform case studies on individual water bodies. Along with the need for further analysis to determine the feasibility of implementing FPV, additional research is needed to understand the added benefits of using water-based installations compared to land-based counterparts. For instance, the evaporative losses quantified in this paper are aggregated as a large-scale approximation simply to capture the extent of the potential impact and lack the granularity and precision at the local level. There is uncertainty associated with the extent to which FPV, with varying levels of water body coverage, reduces evaporation in various regions. Furthermore, water markets are complex, with high regional and temporal variability, and attempting to assess the economic impact on the national scale is beyond the scope of this study. Targeted case studies can empirically measure evaporation reductions, water quality improvements, panel efficiency gains, equipment weathering, and other factors while assessing associated impacts in terms of the local economic benefits and trade-offs. 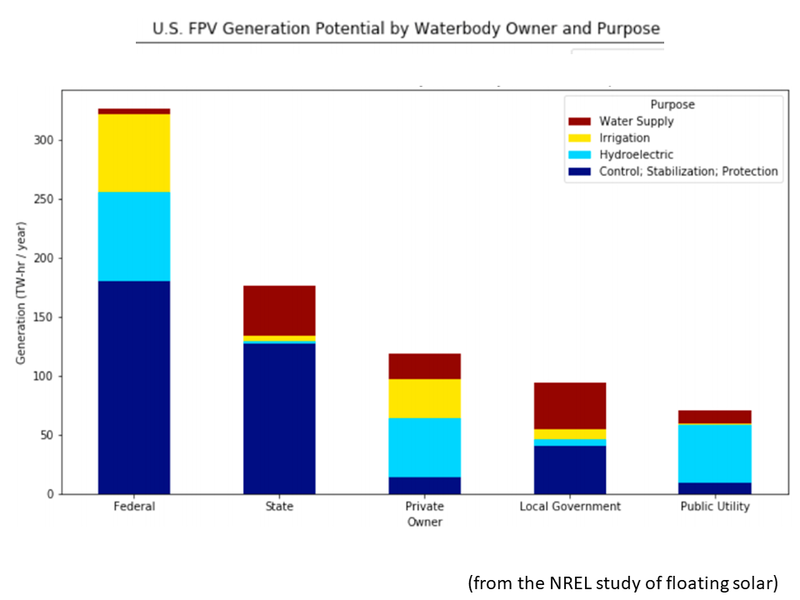 Using conservative assumptions on available man-made bodies of water, we estimated 2116 GW of FPV could be developed in the continental U.S.; covering 27% of the surface area on these bodies of water has the potential to generate 9.6% of current electricity generation. 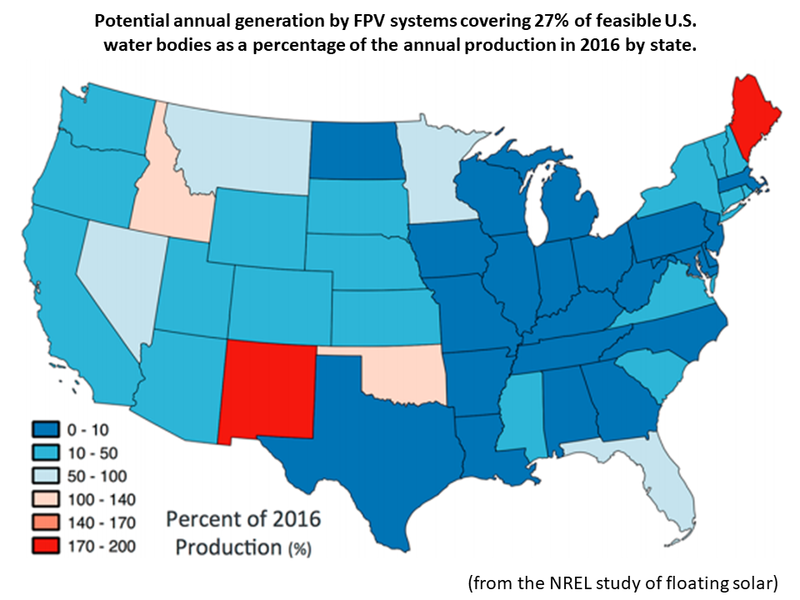 Relaxing some conservative assumptions on reservoir coverage of FPV systems, available reservoirs, and including natural water bodies could substantially increase this potential. This potential shows that the U.S. could benefit from this rapidly emerging technology and that growing focus on FPV within the domestic research community could be advantageous. This significant opportunity warrants future research into the optimal siting, technology configuration, PV chemistries, and material properties of FPV systems. Additional research into potential co-benefits related to evaporation, algae growth, and panel temperature and output are also needed to fully understand the benefits and potential limitations of this new technology.